Happy New Year! To kick off 2017, we sat down with a long-time friend and customer Susan at Black Ink to hear all about her inspiration for opening two stores in Massachusetts! Quick intro, who are you? Tell us a little about yourself! 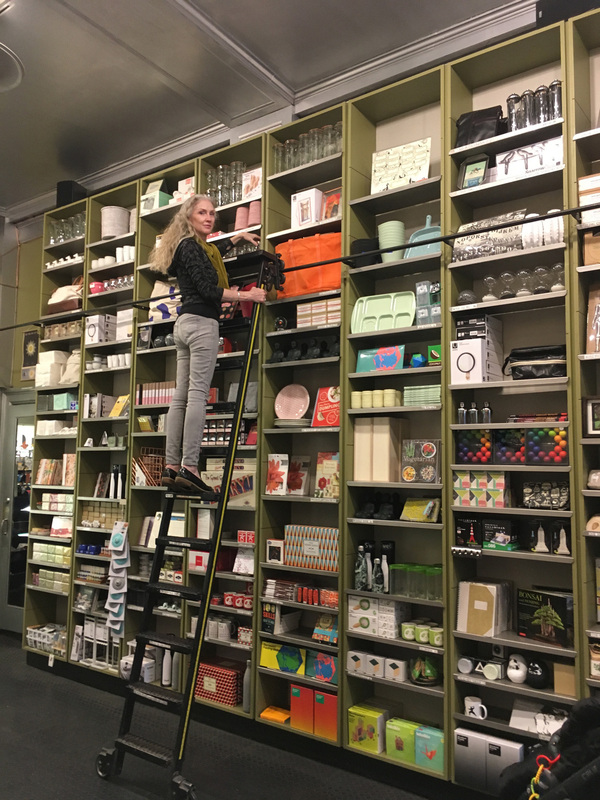 As co-founder and owner of Black Ink, I am buyer, creative director, bookkeeper, master ladder-climber, curator, repository of obscure product information and chief maintenance engineer. Luckily my mid-western upbringing gave me the necessary skills to operate a retail business – a crazy work ethic and resilience. Good thing, as I am also a single parent. My kids grew up in the stores, and now as young adults both work part-time with me. We’ve come full-circle! In which neighborhoods are your stores located in? 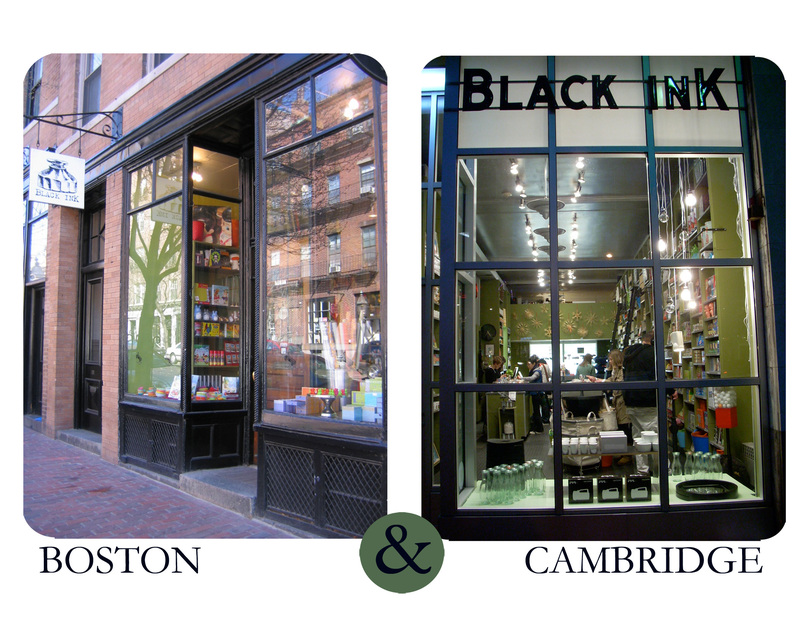 There are two Black Ink stores, the original on Charles Street in the Beacon Hill neighborhood of Boston and the subsequent on Brattle Street in Harvard Square, Cambridge. Our two communities are just three miles apart on opposite sides of the Charles River, yet so different. How long have the stores been open? Tell us your inspiration for opening and a little about your aesthetic. What kind of goods do you sell? We first opened on Charles Street in 1994, fortunate to be given the chance to test our theories. As the business grew, product selection was informed by our experiences as parents, home-owners and members of the community. When the opportunity to expand to Harvard Square arose in 2002 we took all that we had learned and prepared to meet the challenge. Black Ink was named for my favorite color to stamp with, yet our product selection soon expanded from rubber stamps and paper to include just about any category that felt compelling. There was a lot of experimenting as we sought goods that were functional, well-designed and fun to use. My love of paperclips, rubber bands, clothes pins, erasers and ephemera is still obvious in our mix. I discover many things while traveling with my kids, we love to get out and experience other cultures and come back home with a fresh perspective and maybe a few new product ideas. What were your favorite toys to play with as a child? As a child I enjoyed detailed drawing and sketching, and made paper-dolls for my many younger siblings. I also learned to sew my own clothing – beginning a lifetime of projects including ceramics, jewelry making, weaving, carpentry and product design. Which eeBoo toy is your favorite? Why? eeBoo has long been a creative staple at Black Ink! 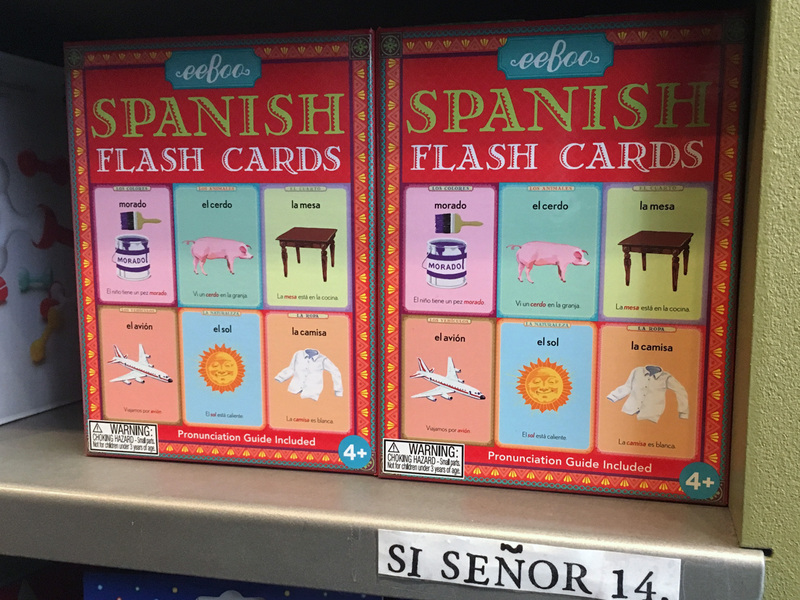 There are a few absolute favorites/long term sellers – notably the French and Spanish Flash Cards and Bingo sets. 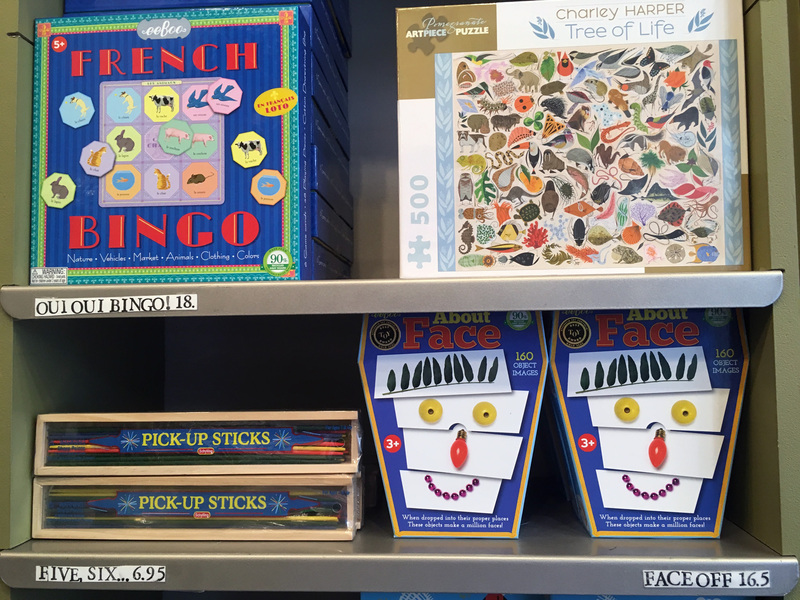 Over the years we’ve also kept About Face on our shelves at all times and recently added puzzles. These products are constantly being newly discovered by customers as well-designed and really timeless interactive games. The aesthetic is just right. Tell us about some of your favorite spots in your stores respective neighborhoods! In Boston and Cambridge we are accustomed to sharing our community with the world. When asked, my staff and I always recommend local businesses, which are the backbone of our neighborhoods. Harvard Square, what can I say? Most people begin their adventure in the Yard (Harvard University’s historic epicenter) and wander out to the actual “square” (which is not square by the way) to really experience the essence of our community. On any given day you will hear multiple languages being spoken, interact with students and locals, and see our ever-changing urban landscape. Look closely for the truly local independent establishments: Harvard Book Store, Curious George, Leavitt & Peirce, Bob Slate Stationers, and of course Black Ink. On a daily basis we suggest Crema for a great local cafe, and our neighbor Cardullo’s – best deli around – not to mention great people watching from their outdoor tables, Charlie’s Kitchen for a beer, and Tealuxe – not just for tea, for an experience. Thanks, Susan! We really enjoyed learning about your stores and how you got started with Black Ink! Something that we at eeBoo noticed on your blog, but that you did not mention in this interview, is that you frequently donate proceeds from your sales to Planned Parenthood and Partners In Health, a Boston-based organization that has been working in Haiti for years on health issues, setting up hospitals and training caregivers. We want to call out your good deeds and express gratitude toward you for giving back where you can! You’re an inspiration to us and a great reminder to spend our dollars within our communities! Check out the interactive map featuring Susan’s local picks for both Cambridge & Boston below! Are you a small retailer? Do you carry eeBoo? We want to hear from you! #eeBooAroundTown showcases small businesses we work with from around the country. Small businesses are vital to local communities, and are the heart of our business. Do you want to participate in our #eeBooAroundTown series? Reach out to samantha@eeboo.com for inclusion!